A contract year is a sacred thing in the NFL. The average football career is shorter than every other sport, and the majority of players who make it past their rookie deals only get one shot at making the big bucks. After a lackluster free agent group in 2018, the 2019 crop offers a bit more depth. Here are the players who have put their best foot forward in the year that matters the most. Flowers had been one of the better interior defenders in the NFL for the past few seasons, but he’s made the leap to join the elite in 2018. Flowers has had 10, nine, seven, and six pressure performances this season already, despite missing a couple of games through injury. His ability to play inside and outside while both rushing the passer and stopping the run will be coveted in a big way. While Paradis’ season was cut short with a leg injury, it’s safe to say that he did enough to secure himself a big payday (health withstanding). 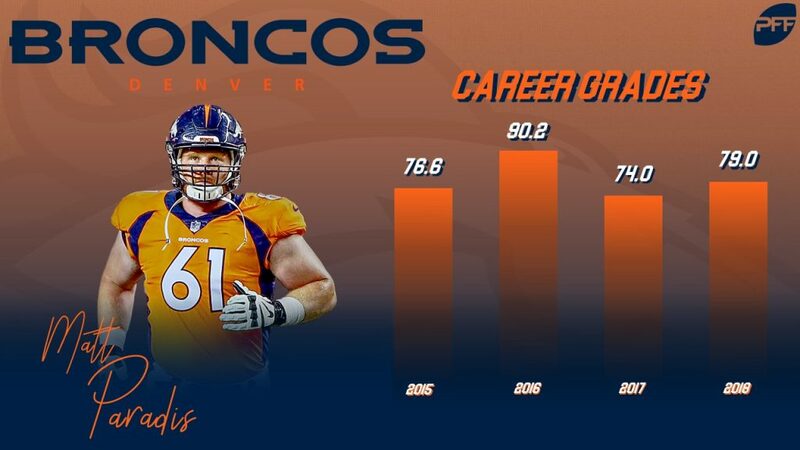 Paradis was the third-highest graded center in the NFL before ending up on IR and looked back to his best after an up and down 2017 season. Any team in need of a zone center should be knocking on Paradis’ door this offseason. 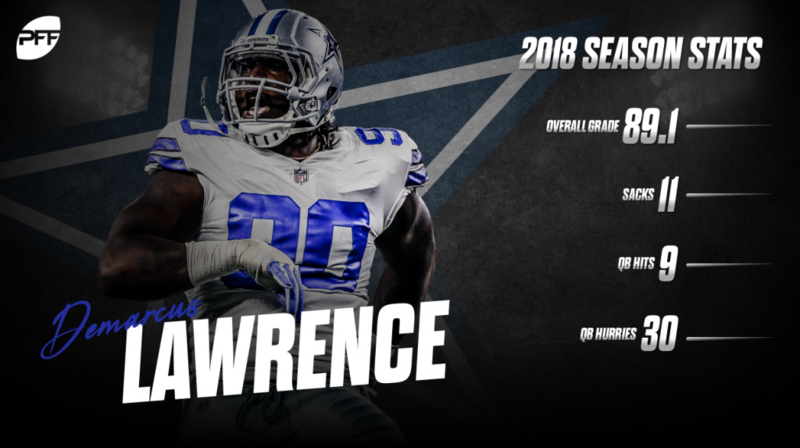 Technically, Lawrence hasn’t graded out quite as well as he did in 2017, but he’s at least proving it was no fluke. He’s notched 11 sacks, nine hits, and 30 hurries through 12 games after collecting 79 total pressures a season ago. His previous career-high was only 46 pressures back in 2015, which is a big reason why the Cowboys franchise tagged him. Lawrence now has a better track record than Olivier Vernon did when he signed his big contract before the 2016 season and will get paid accordingly. The ‘buyer beware’ stigma that exists around big contract years is going to be applied to Ford’s 2018 season in a big, big way. 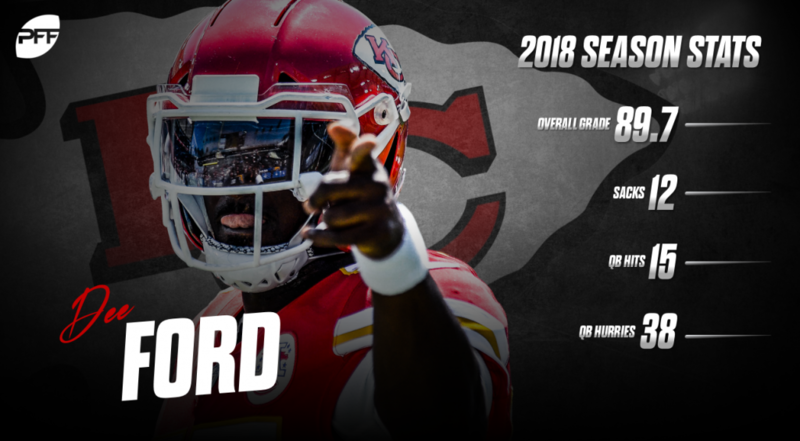 Ford’s previous career high pass-rushing grade was a paltry 65.9, and most of that came off the back of a few late games down the stretch in 2016. This year, the Chiefs’ outside linebacker has a 91.7 pass-rushing grade – tops among edge rushers. That’s an absurd jump that a lot of teams are going to be wary of and makes him an ideal candidate for the franchise tag. It’s likely that the 5’9″ Callahan gets the slot corner label, but it’s a position that’s growing in value with each passing year. He’s already been on the field for 663 snaps this season which is more than all but 14 defensive linemen have played. He’s also damn good at what he does. 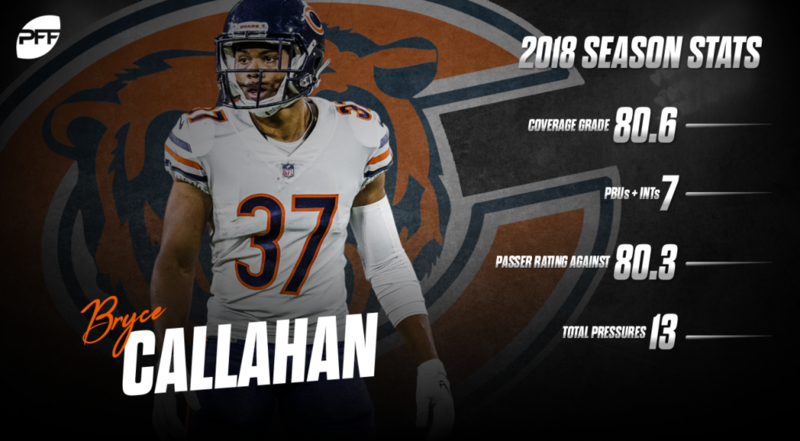 Callahan’s 80.6 coverage grade is 12th among all cornerbacks, and he’s been a nightmare for opposing quarterbacks with 13 pressures to lead the position. Another edge defender that seemingly came from nowhere. Smith has already surpassed his single-season high for pressures in a season with 44 so far and ranks seventh among all edge defenders in pass-rushing productivity. Much like Ford, this is so far away from the player we’ve seen before that it’s difficult to trust what we’re seeing. His 82.8 pass-rushing grade is over 20 points higher than his previous best. Approaching 31 years old, Jackson is having by far his best season in the NFL. The Texans’ ageless wonder currently owns an overall grade of 85.8, which ranks sixth among cornerbacks this year. He’s allowed just 32 catches from 53 targets and he has yielded only 359 yards on throws into his primary coverage. He’s allowed a passer rating of just 64.9, good for fourth among players at the position, and he’s the only cornerback season with multiple interceptions (2) and multiple pass breakups (3) with no touchdowns allowed. As if his ability in coverage isn’t already enough to intrigue NFL defenses, Jackson has also tallied 10 run stops on the year, which is the third-most among the league’s cornerbacks. There was some uncertainty for a short period to start his career, but Clowney has more than put enough on tape to cash in on a big payday. While his 2018 pressure total (36) is seven fewer than his number at this point last year, the former South Carolina standout is still winning 12.2% of his pass-rush snaps, which currently ranks 26th among qualifying edge rushers and tops notable names such as Arizona’s Chandler Jones and Tampa Bay’s Jason Pierre-Paul. While it may not be Clowney’s strongest year in terms of generating pressure, he’s in the midst of a career year against the run where his run 86.9 run-defense grade ranks second among players at the position.